The demographic or economic pressure of Yamna migrants must have been responsible for the events in Iberia before the arrival of East Bell Beakers, which brought about a reduction in the size of settlements and an increase in violence, signalled by changes in technology and organisation of metallurgy, concentration of wealth, proliferation of weapons, and displays of violence and individualised power, reflecting the synchronic economic and political transformations seen in western Europe (Blanco-González et al. 2018). In the north, centre and west of the peninsula, the most common settlements are ‘pit fields’ (campos de hoyos), open settlements occupied temporarily or seasonally with varied structures used as silos to store grain, rubbish dumps, sites to place offerings, homes, graves, or dwellings. They were probably inhabited by dozens of people, and were probably highly autonomous in their production economy, evidenced by the tools found related to processing, storage, consumption of food, and production of pottery, stone, bone, and metal objects. Some hilltop settlements can also be seen, probably also non-permanent sites linked to seasonal exploitation of certain resources (Lull, Micó, Herrada, et al. 2013). Their subsistence economy was based on stockbreeding, on an increasingly developed agriculture—with specialised flint working for preparation of sickle teeth—and increase in number of silos per settlement with greater storage capacity, in comparison with the Copper Age. Metallurgy also improved, with extensive extraction of ore in the centre and the north, not related to economic centres as in El Argar, but rather widely distributed locally among settlements. Pottery is dominated by plain vessels, continuing the East Bell Beaker Begleitkeramik, coexisting with local Bell Beaker developments (Lull, Micó, Herrada, et al. 2013). While funerary customs do not show a clear break with the earlier collective burials, there is a trend towards reduction in size of the tombs and in the number of bodies they contained during the Chalcolithic. This tendency culminates in the practice of individual burials, especially in central and west Iberia, described as an evidence of social inequalities in these territories. Chalcolithic settlements of the south-west are abandoned, a sign of a drop in population and a change in social order, more radical and evident than in the central territories (Lull, Micó, Herrada, et al. 2013). In the northern Meseta, during the Bell Beaker phase (ca. 2500–1900 BC) a high degree of craftsmanship develops, with a standardised repertoire of pottery forms and decoration including incised (triangles), combed impressions, rare schematic representations, and burnished surfaces; flint for knapped blades; green stones for beads; and copper to smelt awls and flat axes. These distinctive items spread everywhere during the Bell Beaker expansion, elevated locations gain importance, sites decrease in size and are more distantly spaced, while burials in old megaliths coexist with isolated single burial pits and graves under tumuli with rich furnishings (Blanco-González et al. 2018). Two subcultures appear in the northern Meseta: a south-western region, characterised by more labour-intensive tumuli, stone-walled and ditched sites, southern imports, and manufacture and distribution of local variscite beads; and the eastern region, featuring smaller tumuli, a lack of walled or ditched sites, and engagement in different exchange networks—including green talc beads, and characteristic pre-Beaker and Beaker pottery styles. Economic activity, rising since the Chalcolithic, peaked during this time (Blanco-González et al. 2018). The Early Bronze appears in the north with the distinctive ‘Parpantique group’ in Soria (ca. 2100 BC), showing coarser pottery, with household wares predominating over fineware, bowls lacking careful burnished treatment, incised and figurative decorations disappearing, as flint becomes less common. Stone mining tools appear, as well as arsenical copper tools and new types of pottery, like carinated vessels, S-profile jars with flat bottoms and fingernail impressions on rims, and thumb-impressed rope design. Open-air sites predominated, with occupation of prominent hills (related to herding strategies) , but lowland pit sites continued, and some caves were also inhabited (Blanco-González et al. 2018). In the southern Meseta ca. 2500–2000 BC, the Maritime style predominates in the initial stage, including undecorated Bell Beaker assemblages, and female burials have also been found. An abrupt change is visible particularly after ca. 2000 BC in the Tagus Valley, when agrarian landscapes became unsustainable and were transformed into diversified ones orientated to pastoralism, although a relative continuity in material culture and settlement patterns can be seen. Bronze co-smelting reached the Tagus basin ca. 1800 BC, probably from north-eastern Iberia, and exogamy dynamics are observed with immigrants from the Central System (Blanco-González et al. 2018). A Protocogotas decorative style emerges ca. 1800/1700 BC, characterised by the application of motifs using incisions or impressions (ears of wheat, triangles) on the upper part of the vessels. Protocogotas evolves to Cogotas I ca. 1500 BC, featuring the use of geometrical motifs (garlands of concentric semicircles, wolf’s teeth, rows of spikes or circles) executed by means of linear incision techniques, bouquique (dot and line decoration), ‘sewn’ decoration, and excision. Various vessels appear, with the emblematic pottery formed by dishes with the lower part of the body as a truncated cone shape with high carination, open platters and pots with prominent rim (Blanco-González et al. 2018). Cogotas I pottery spreads across a large part of the peninsula, signalling the start of the Middle Bronze in different regions, coinciding with the last two centuries of the Argaric wold, although no significant archaeological change is perceived in these regions. In general, a shift of economic power is seen from the south-east to central and west Iberia with the demise of El Argar. From the Ebro to the Duero and upper Tagus regions, including the Atlantic coast, settlements continue to be divided into upland sites and ‘pit fields’ in the lowlands, with pits occasionally used as tombs for individual interment with few or no grave goods (Lull, Micó, Herrada, et al. 2013). Before ca. 1300 BC, there seems to be no major differences in metallurgical production or any other economic aspect compared to the previous period, which suggests long-term stability. Settlements composed of a few dozen individuals, relatively high mobility, stockbreeding as the basic subsistence economy, with the relevance of agriculture and the population density being dependent on the geographical conditions (Lull, Micó, Herrada, et al. 2013). After ca. 1300 BC there is an increase in exchange of products, particularly metal objects, connecting the Atlantic with the Mediterranean coast, suggesting a new gradual shift of economic power to the Mediterranean and the south, marking the beginning of the Late Bronze Age. In the Meseta, the Cogotas I style prevailed, with large hilltop settlements and small low-lying villages participating in the production and circulation of Atlantic bronzes. Certain central settlements seem to have dominated over surrounding territories (Lull, Micó, Herrada, et al. 2013). During the Chalcolithic (ca. 3300–2200 BC), south-west Iberia shows intense networks of contact and exchange, although there is great variability in terms of settlement and funerary rituals. Larger sites are occupied for centuries, while smaller sites seem to have a shorter life (few centuries or decades). Enclosed settlements featured round houses with stone foundations, within and outside of the walls, and evidence of metallurgical production. Distinctive ceramics, vessels with impressed acacia leaf designs, and plates with almond-shaped rim, as well as groundstone tools, grinding tools, flint blades and arrowheads, and copper items (Blanco-González et al. 2018). The earliest Bell Beaker pottery appears ca. 2700 BC in fortified sties, of the International/Maritime, Palmela, and Incised styles. It is during this period when ditched enclosures made up of concentric rings of ditches and scattered pits, which had started ca. 3500 BC, reach their apogee, ca. 2500 BC, to disappear completely ca. 2250 BC. They showed evidence for productive activities (metallurgy), food consumption, depositional acts, and mortuary structures and rituals within the domestic space. The dead were housed collectively in hypogea, or in pits or reused caves and megaliths (Blanco-González et al. 2018). · The end of ditch-digging and monumental negative earthworks, ca. 2250 BC. · Monumental settlement architecture, typical of the Neolithic, disappears after ca. 2500 BC. · Abandonment of sites, establishing new habitats, a process which had started ca. 2500 BC. · Material culture shows an interruption in the pottery (plain pottery instead of incised wares), textiles (heavier loom weights), rarity of lithics, likely replaced by metal items. · Iconoclastic attitude, probably related to a profound cosmogonic shift, with the disappearance of Chalcolithic figurative and geometric representations, such as engraved slate plaques, standardised astral, anthropomorphic, and zoomorphic items made in exotic materials. · Shift from monumentalised collective burials to individualised interments in less visible tombs, beginning during the Beaker phase. Practices revolve thus around the singularisation of certain individuals in cists, with burial items associated with bodies, all in a more standardised way. Bell Beaker graves are found in caves, tholoi and other megalithic tombs, showing an integration of the incoming ideology with the previous regional customs. Beaker objects found in cist burials belong to the Epi-Bell Beaker period, during the Early Bronze Age, during which individual graves were housed in separate cist burials, but were associated with objects typical of the Beaker period, such as Beaker vessels, copper daggers and wrist guards, as well as ceramics (like carinated vessels) found in the Middle Bronze Age. All this points to an archaising trend among Bell Beakers who settled in the region (Blanco-González et al. 2018). During the Early Bronze Age (ca. 2200–1500 BC), there is thus a shift to a hybrid society which shows a semi-nomadic lifestyle, with less visible low-lying pit sites, and funerary practices involving inhumation in necropolis of cists, covachos and cairns, disconnected from settlements. Reuse of megaliths and natural caves has been interpreted as an appropriation of the past by these communities. The overall activity declines, showing probably a decrease in demographic density. Some hilltop settlements appear in the early 2nd millennium BC, possibly related to their more sedentary activity, such as metallurgy, and potentially under the eastern influence of El Argar settlers in the Guadalquivir River basin (Blanco-González et al. 2018). The mining of copper and silver resources and their processing were probably the a key factor in the intensive occupation and control of the Sierra Morena Mountains during the EBA. The regional relevance of the industry is especially visible in the mines of central and eastern areas and during the Argaric Bronze Age, when the number of settlements increased compared to the previous period. Medium-sized settlements show evidence of the whole process of transforming mineral into metal, and their locations were most likely linked to territorial control, processing and distribution of the metal, and the spatial distribution and exploitation of the mines. Control over production and distribution was probably in the hands ofelites, which could have accentuated the social asymmetry seen in the so-called Alto Guadalquivir Argaric group, increasing the need for ornamental artefacts and weapons as a means of accumulating and displaying wealth and power (Arboledas-Martínez and Alarcón-García 2018). In western Iberia, from the Low and Middle Tagus to the north, the Final Atlantic Bronze Age (from ca. 1500 BC) intensifies its contacts with the rest of the Atlantic and the British Isles, as evidenced by bronze weapons and tools, often gathered in hoards. Iron objects appear before the turn of the millennium (Blanco-González et al. 2018). 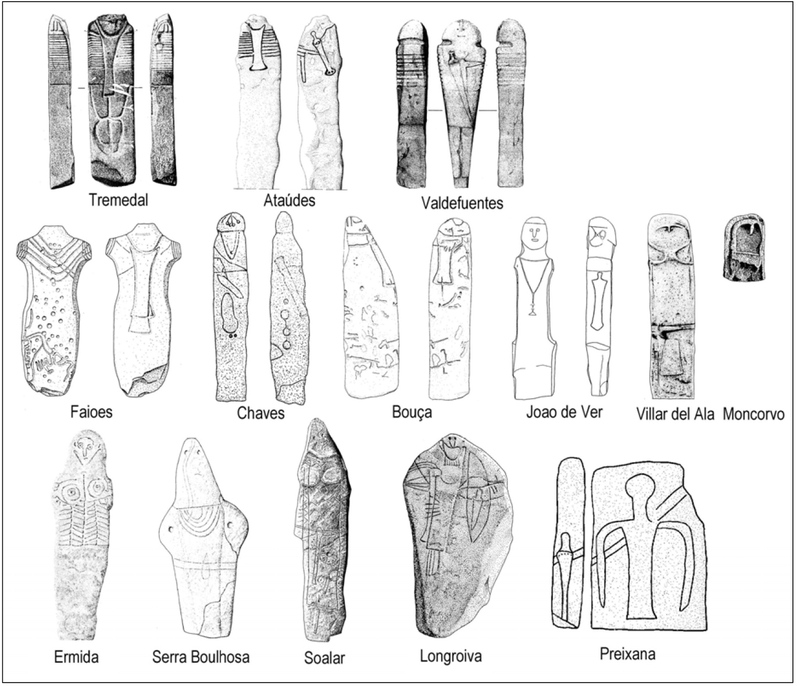 The widespread anthropomorphic stelae and statue-menhirs of the west (Figure 52) may have been used as territorial markers, or formed part of funerary or commemorative practices linked to distinguished figures, maybe military leaders. They show the emergence of elite individuals who share the same symbols at a supraregional level, expanding from the lower Douro are to the south and south-east (Rodríguez-Corral 2018). Figure 52. Stelae from the north-west Iberian group, after Bueno et al. 2005a. Image modified from Bueno Ramirez et al. (2011). The lowest levels of human activity are reached ca. 1400 BC, increasing thereafter. Settlements in central and northern Portugal include hilltop sites between 0.05 and 1.5 ha, which reach their peak in the 10th c. BC, showing remains of intensive metallurgical production, with small communities and a subsistence economy based on agriculture, stockbreeding, acorn gathering, and limited hunting. This would give way to the Baiões-Vénat horizon at the end of the 9th to the mid–8th c. BC (Lull, Micó, Herrada, et al. 2013). The prevalent decorative technique of Bell Beaker pottery in the Atlantic façade during the second half of the 3rd millennium was the shell impression using Cerastoderma edule, while from 2500 BC regional incised and impressed bell beakers are found in burial context throughout the region. The earliest nucleation dynamics in the north seem to have happened already by the mid–3rd millennium. Burial rites show the selective inhumation of specific individuals, often in places used since the Neolithic, such as rock-shelters and burial caves, pits within habitats, reused megaliths and small tumuli (Lull, Micó, Herrada, et al. 2013). The northernmost regions (eastern Galicia, the Cantabrian strip, and the north-eastern sector to the north of the Ebro valley) underwent minor changes in settlement and burial practices ca. 2300 – 1900 BC, and no clear-cut cultural rupture is seen. Neolithic-like lifestyles continued, and cultural shifts happened later than in other Iberian areas, showing stability and resilience of these northern communities, which developed relatively sedentary agrarian lifestyles and were integrated in long-distance exchange networks since the Neolithic (Blanco-González et al. 2018). The Atlantic areas show a marked and statistically significant fall in human activity ca. 2200 BC, with a subsequent recovery ca. 1600 BC, which are matched by palaeoenvironmental proxies and a lack of known EBA sites. Asturias seems to have become the most dynamic area of northern Iberia, becoming an important metallurgical centre and trading nucleus for Iberian and Atlantic exchange, based on findings of weapons and metal goods, including mining tools. This exchange involved especially western Iberia, i.e. present-day Galicia and Portugal, while the western Pyrenées and Aquitania remained possibly isolated, based on the scarce findings from this period. Three main mines show activity from the Bell Beaker period (ca. 2500 BC) up until ca. 1500 BC, with the mining complex of El Aramo representing one of the biggest subterranean prehistoric mining complexes in Western Europe, composed of an extensive system of galleries, pits, and wide excavations. The large-scale extraction activity from this mine (ca. 6700 tonnes extracted) can only be explained by a strong intra- and interregional demand for materials, and a shaft-hole axe from Bohuslän, Sweden (ca. 1600–1500 BC) may have originated in this mine (Reguera-Galan et al. 2018). After a period of decline in international exchange coinciding with the exploitation of copper mines from Wales, there seems to be a poorly understood gradual change in material culture in the eastern Atlantic sector, dated around the mid–2nd millennium BC, and consisting of higher levels of agricultural production, settlement diversification, and increasing human pressure. These trends are different from the upper Ebro basin, which follows the cultural evolution of north-eastern Iberia (Lull, Micó, Herrada, et al. 2013). The intrusion of steppe-related migrants represents a replacement of 40% of the population, and near 100% of male lineages in Iberia after ca. 2000 BC (Olalde, Rohland, et al. 2018). This replacement of old Iberian Beakers by East Bell Beakers is seen in ancient samples almost overlapping in time (ca. 2700–2000 BC) from sites in the north, centre, south-east and south-west. Earlier samples show no Steppe ancestry and predominantly haplogroup I2-M438 (at least two I2a1b1-M223 in the Meseta and the north, two I2a1a1-M26, and one I2a1a2a-L161 in the south-west), as well as one F-M89, and one H2-P96. Later samples show Steppe ancestry (ca. 23% in the north, ca. 35–50% in the centre) and only R1b1a1b1a1a2-P312 lineages. In particular, three are reported from Madrid (ca. 2500–2000 BC), one of them R1b1a1b1a1a2b-U152, while one from Burgos shows R1b1a1b1a1a2b1-L2 (Olalde, Brace, et al. 2018). Bronze Age samples from the centre and west also show Steppe ancestry (ca. 13-20%) and R1b1a1b1a1a2-P312 lineages, including the earliest reported R1b1a1b1a1a2a-DF27 sample, associated with a southern territory of the Cogotas I culture, in the Meseta (Martiniano et al. 2017). The expansion of early R1b1a1b1a1a2-P312 lineages with incoming Classical Bell Beakers, like R1b1a1b1a1a2b-U152 and R1b1a1b1a1a2a-DF27 subclades, confirms a late spread of R1b1a1b1a1a2a-DF27 subclades in Iberia, estimated with studies of modern populations to have happened ca. 2200 BC (Solé-Morata et al. 2017). The only certain non-Celtic Indo-European language of Iberia is Lusitanian, which has been linked to a potential Galaico-Lusitanian group spread from the north-west to the central-south Iberian Peninsula, based on inscriptions, anthroponymy (Figure 53), and theonymy (Vallejo 2013). The expansion of proto-historical Lusitanian speakers may be clearly linked in archaeology to west Iberians spreading with anthropomorphic stelae during the Final Atlantic Bronze Age. There has been some discussion about the non-Celtic nature of the languages of Cantabri, Astures, Pellendones, Carpetani, and Vettones (Adrados 1998), which may be thus more or less closely associated with Lusitanian, too, as an ancestral Indo-European branch spread through the Meseta and west Iberia with Bell Beakers, before the arrival of Celts. There is a comparatively lesser presence of R1b1a1b1a1a2a1-Z195 subclades—proper of north-central and north-east Iberians—in west Iberia, which be related to less marked Y-chromosome bottlenecks in general, and thus no episodes of radical male replacement after the Bell Beaker expansion. In particular, western Iberians show relatively high frequencies of R1b1a1b1a1a2a-DF27 (x R1b1a1b1a1a2a1-Z195) subclades (Solé-Morata et al. 2017), although the bottlenecks caused by the expansion of Celts and the Reconquista may have complicated the ancient picture, because of the apparent higher genetic diversity in the north-west (Bycroft et al. 2018). Figure 53. Distribution of Lustanian anthroponymy. Data from Hesperia – Banco de datos de lenguas paleohispánicas, image modified from Vallejo (2013). While the position of Tartessian as Indo-European (Koch 2009) is highly doubted, there is some support for a borrowing of names from a “lost Indo-European language” over the course of long-term contacts (Mikhailova 2015). This is compatible with El Argar-related Proto-Iberian-speaking peoples occupying hilltop settlements and dominating over Indo-European-speaking peoples in south-west Iberian territories during the early 2nd millennium BC. Some of these territories would later form the Proto-Tartessian community, with close interactions between neighbouring Iberian- and Lusitanian-speaking peoples in south-west Iberia for centuries, before their historical attestation. Copper Age populations from north Iberia are not a good fit for Iberian Bell Beakers, because they harbour more hunter-gatherer ancestry than what is found in the available samples (Olalde, Brace, et al. 2018). Modern Basques, like other modern Spanish and French, harbour increased NWAN-related ancestry, which links their language—like Iberian or Paleosardo (see §vii.6. Basque-Iberians)—to the resurgence of farming communities expanded from Anatolia (Gunther et al. 2015). Nevertheless, based on the modern Basque population as a proxy for the Iron Age community, pre-Basques around the western Pyrenées before the Iron Age may have been different from neighbouring populations in their extra hunter-gatherer ancestry (Mathieson et al. 2015). It would be thus conceivable but highly controversial (Prósper 2013) to give credit to the nature of Proto-Basque as of Pre-Indo-European substratum (Forni 2013), or even as forming part of a Proto-Indo-European–Euskarian macro-family (Blevins 2018), beyond the known pre- and post-Roman Indo-European superstrata (Koch 2013). This could be nevertheless supported using genetic research by the presence of increased hunter-gatherer ancestry from the Villabruna cluster, including the presence of typical Villabruna-related R1b1b-V88 lineages in north-east Iberia since the Early Neolithic in the late 6th millennium BC (Haak et al. 2015) up to early Proto-Beakers in the late 3rd millennium BC (Olalde, Brace, et al. 2018), coupled with the hypothesised Basque toponyms in north-east Iberia. The modern population from historical Basque-speaking regions shows predominantly Yamna-derived lineages (ca. 90%), especially R1b1a1b1a1a2a-DF27 subclades, with its diversity suggesting a rather early infiltration of Bell Beaker lineages among the dwindling Chalcolithic-like population of the Atlantic façade of the Franco-Cantabrian region, as well as later Y-chromosome bottlenecks during their expansion. One of these bottlenecks is thus most likely associated with the population expansion in the western Pyrenées during the Middle Bronze Age, which is supported by the survival of extra hunter-gatherer ancestry. Other bottlenecks may have happened among Basques during the Roman presence in Iberia, due to the region’s isolation from further Eurasian gene flows, reflected in the similarity of modern Basques to Iron Age Iberians (Olalde, Rohland, et al. 2018). One such bottleneck may be found in the recent expansion in north-central Iberia (north Meseta, Cantabrian region) of haplogroup R1b1a1b1a1a2a1a1a1-Z278 (formed ca. 2500 BC, TMRCA ca. 1200 BC), particularly its subclade R1b1a1b1a1a2a1a1a1a1-M153 (formed ca. 900 BC, TMRCA ca. 600 BC), almost exclusively present among modern Basques (Solé-Morata et al. 2017). This is compatible with the expansion of a Pre-Basque community isolated in the Atlantic Coast, in Aquitania, and expanded into modern Spanish territories during the Iron Age, since Basque toponyms in the area are only attested from the Roman period (Villar Liébana 2014).